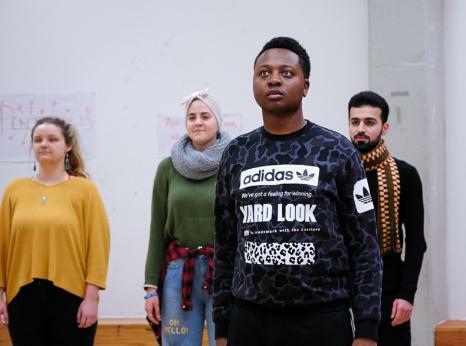 Coram's National Theatre project runs fortnightly workshops for you to work with theatre artists from the National Theatre to develop your voice, storytelling & performance skills. When: Tuesdays 6pm - 8pm. Who: This project is for young people supported by Coram’s Young People programmes. If you are a young person aged 16-25 and a parent; adopted; care experienced; or from migrant or refugee background this programme is for you! This project is part of National Theatre’s Public Acts - a nationwide initiative to create extraordinary acts of theatre and community. If you would like to be informed about future sign up opportunities then simply fill in the form at the bottom of this page to register your interest. Please make sure you have read the privacy notice before applying. We ask for your date of birth and background so we can make sure you are eligible for our programmes and to make sure that we follow the right processes to support you in line with your age. We ask for your age and gender so that we can evaluate our programmes and make sure we’re working with a diverse range of young people. Please specify where you heard about this project, if not listed above.